I first met Willians while conducting research for a Fulbright grant in Brazil. 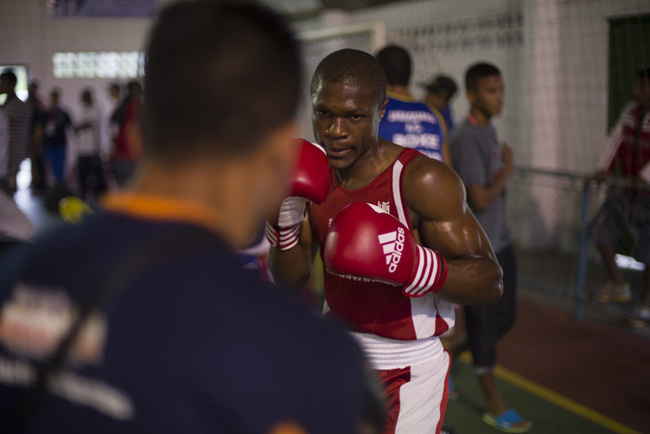 My proposal was to study the effects of boxing in the favelas of Rio de Janeiro, and the methodology was to interview, photograph and get in the ring with the fighters myself. Having trained about nine years as an amateur-hobbyist, I knew what I was doing, more or less. 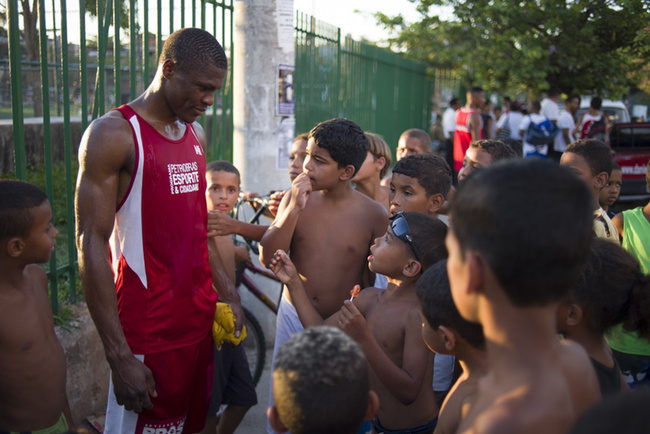 I chose the gym Fight For Peace, primarily for its mission, which is to deter youth from entering the infamous favela drug trade through a combined program of martial arts, education and employment training. When I explained my project to the head trainer, he pointed over to Willians: the only regular that was in my weight class (152 lbs). Willians has a body composed almost purely of muscle, hands that could cup the skull of a baby elephant, and a type of Gumbi-like flexibility that is unnatural, even for a pugilist. Fighting with him is much like facing off against a piece of heavy machinery—something between a tractor and a Sherman tank; his defense and work-rate reminded me of steel claws excavating the earth for some reason. However, like most fighters, apart from his persona in the ring, Willians is one of the kindest people I know, and what he gets out of fighting might be the opposite of what most people think about the sport. I spent nearly my entire Fulbright term standing in as Michel’s sparring partner, as there were few who could measure up to his size and ability (or none as foolish as I), and I continue sparring with him today. Our constant encounters have created a friendship (as most fighting relationships often result), and from there our paths cross in different ways. At one point we even started planning a language exchange between English and French. 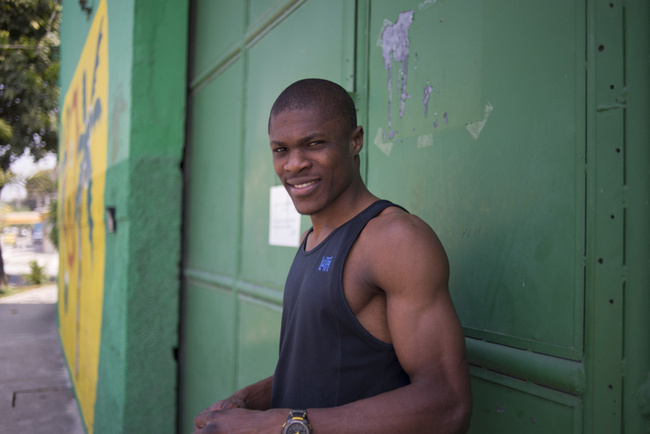 Landing in Brazil with little money and no Portuguese, Michel immediately began working towards his goal of becoming a professional fighter, a dream he’s had ever since his father told him about Mike Tyson when he was a child. He sought out the best, searching for the gym with the most wins and recognition at the fights, and has stayed there ever since. And though the partnership between fighter and academy has worked out swimmingly thus far, it certainly isn’t the “easiest”gym to be a part of. Fight For Peace is located in Nova Holanda, one community in a complex of favelas called Maré, which historically had some of the highest rates of drug trafficking and drug related violence. Currently, the community is occupied by the Brazilian military, brought in to stabilize the area during the World Cup. It is on the short-list to soon go under the infamous “Pacification” process, a controversial state initiative aimed at expulsing drug traffickers and inserting a permanent police presence inside the community. Establishing and maintaining the police units have been mixed in other favelas throughout the city, so the expected amount of violence to result from the operation is still unknown. The violence, however, isn’t the take-away Michel gets after training. Willians stands outside of the entrance of his room, located inside one of the main shipping centers of the Coco Verde company. Sitting on a record of 56 wins, 9 losses and 15 knockouts, Willians is well on his way towards that better day. He tells me he’s beaten nearly every welterweight in the nation, and is on the radar of most serious boxing scouts in the area. At 22 years old, he’s moving in the right direction and tempo towards his goal, but walking that path has not been any sort of easy. I spent one afternoon having lunch with Michel and visiting his home. He lives in Jardim America, a neighborhood about 30 minutes north of the gym, and while it is still in the north zone of the city, it is not a favela, which means it escapes many of the complications of the drug trade. He signals the stop in front of a large green and yellow factory building with the words “Coco Verde”spray-painted on the front. “Coco Verde”is a company that makes decorative landscaping ornaments from the leftovers of discarded coconuts. At first I think the stop just happens to be outside of the factory, but Michel walks up to the entrance and unlocks the door. The owner, a French transplant from Algeria and a pretty serious fight fan, once met Willians at a local bout and decided to help by allowing the fighter to stay rent-free in the back room of the factory. Willians leads me past a flimsy aluminum door into a basic room tiled with linoleum. I take off my shoes and pass a small bathroom into the main room where a long dark-brown table sits covered with his belongings. Shoeboxes, clothes, title belts and magazines are spread across the dark oak. A rocking chair, and a small 12-inch television finish off the living room and behind it is a kitchen equipped with a refrigerator, standard sink and a microwave. When I ask him where he sleeps, he pulls out a twin mattress from behind the refrigerator, drags it out into the living room, and plops it down on the floor. I look around the room and there seems only to be the bare necessities of living. I ask him what he does to pass the time. He shows me some small dumbbells in the corner, pulls out a French boxing magazine and points out an article about the mentality of fighting. Most of the time he’s either at the gym training or resting at home. 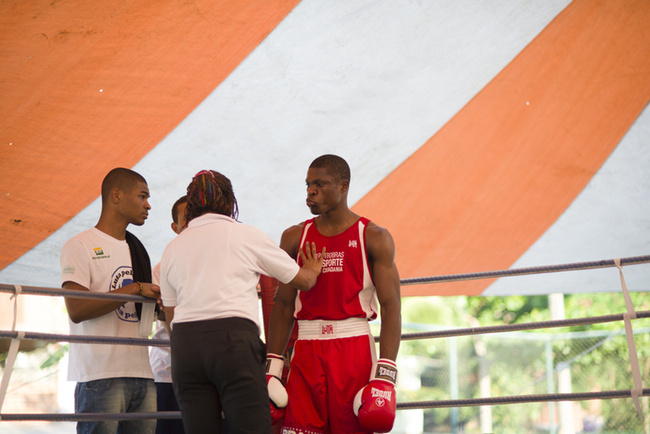 “The only thing that keeps me persevering in boxing is because I love it, that’s it. I love it for real. Because if it wasn’t boxing, I don’t know what I could do better,” he says. I find that hard to believe. To me, Willians is very clearly an intelligent and capable person, fit for most respectable jobs; it’s more that competing in tournaments throughout the country prevent any sort of predictable schedule that an employer could rely on. Plus he tells me that work would take away from his training, so he’s more or less put everything on the line for the sport. 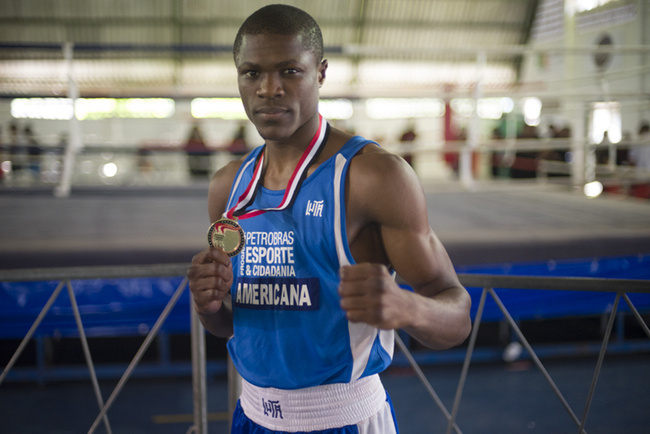 Willians receives a $R300 monthly stipend from Fight For Peace as part of their athletic scholarship program offered to those seriously training in the sport. Occasionally, he is contracted by other gyms to represent their state at national tournaments and might gain a little something on top of it if he wins. 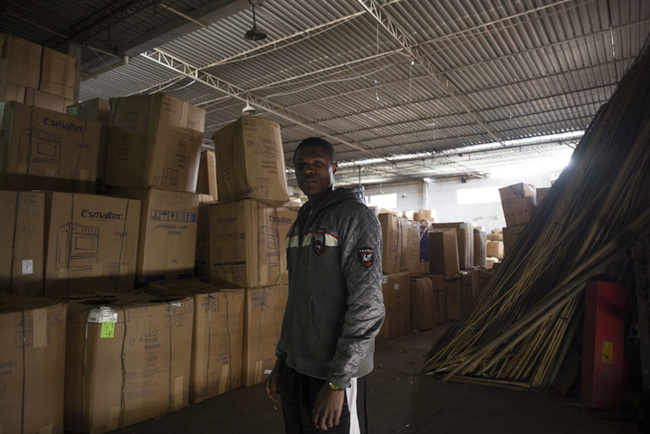 In addition to the free housing, the factory owner also pays him $R300 a month for boxing lessons, which leaves him at a little less than $270 US dollars per month, less than the current minimum wage here in Brazil. On most days, Michel eats lunch at the Coco Verde main office free of charge, but because I am with him that day, he calls to let their kitchen know that he won’t be attending. Instead, we head over to a local all-you-can-eat restaurant across the street from his home. The prices there are better than that in most parts of the city, about $R6 for as much as you can pile onto one plate. I gather a healthy serving of vegetables, pasta and beans; Michel taking far less due to making weight for his next fight. He tells me he’s going to train in Brazil for another 2 years in the amateur circuit, but gets a bit worried when thinking about his professional career. 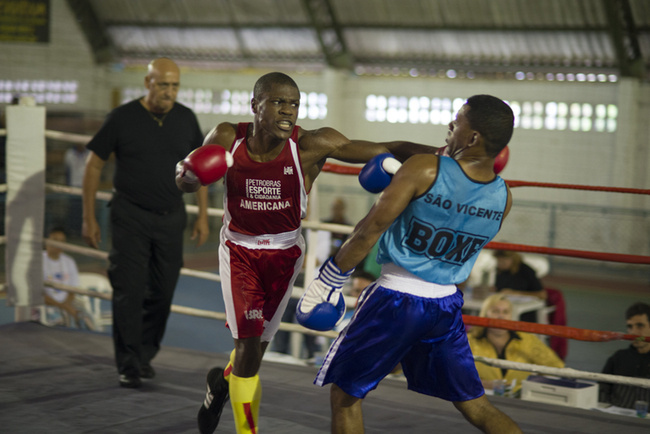 Brazil doesn’t exactly have the most vibrant boxing scene. He follows up by listing off a few places where he might relocate to pursue the professional ranks, but hasn’t yet figured out how to get there. Most people probably wouldn’t guess that Michel and I came to know each other by punching each other in the face, or that it’s what we do the majority of the time we spend together, but it would be ignorant to think that it hindered our friendship. If anything, it was the basis of it. To know someone in battle, to witness their vulnerability and their capacity to be kind to yours, you are able to see their violence and compassion, an honest picture of who they are. He is my sparring partner, and when you think about the purpose of that role, it is to help someone prepare in their search for victory. We get up to pay for our meal and I’m fully prepared to treat Willians for showing me a bit of his life. I pull out my wallet and unroll a multicolored fan of Brazilian currency, but before I can do anything, Willians pulls out his own. A lone $R20 bill sits in the pocket and he hands it over to the cashier. He signals for two with his fingers. I stand uneasily and do this nervous gulp, trying to explain that I’d gladly pay for the two of us, or at the very least, pay for my own meal. The fighter simply looks at me and smiles. Nick Wong is a traveler, writer and photographer that has spent the last decade exploring the world through the culture of prizefighting. See more of his work on his website.